A walk in an area of history and mystery. We will enter Morston Church to hear about the Villagers’ claim to fame. Walking on, we reach Stiffkey with a couple of tales to tell. Moving onto the tiny hamlet of Cockthorpe with lunch (packed) in Cockthorpe Church, there we will hear about this hamlet’s connexion to not one, but three Admirals. You will hear something of their exploits, and possibly the odd Yo Ho Ho (could there be treasure?)…! Finally, to a state of the art museum – Langham Dome, Norfolk’s ‘Tardis’ (larger on the inside than out) and its place in the Cold War. 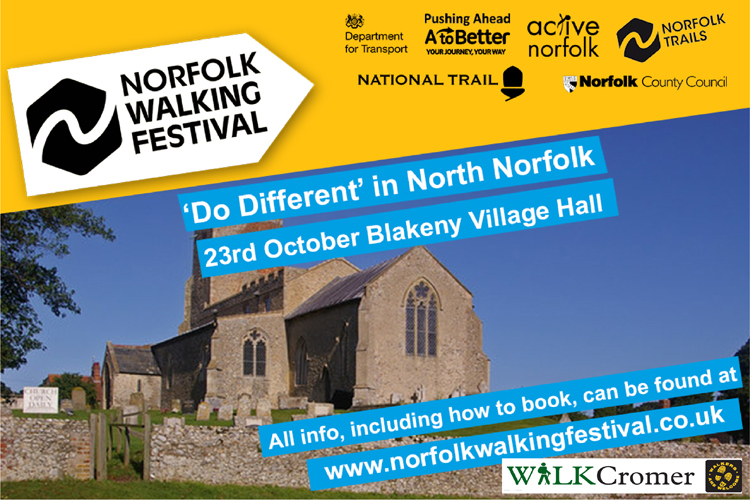 This walk will take you via the Coast Path from Blakeney with wide views over the finest Marshes in Norfolk. The Marsh and Saltings abound in birdlife. On the walk you may see deer, rabbit and hares. Look down you might spot the odd snake; or even a mole going from one Norfolk mountain to another. There is something for all the family, a fantastic walk under huge skies and stories that will cheer or chill – but leave you wanting more of both. A Family walk to remember. Getting there: Cars can park at Blakeney Village Hall. You can get the Coasthopper from Cromer/Sheringham. Any other information: Bring Packed Lunch. A walk and talk along the upper stretches of The River Mun. Led by Eddie Anderson, landowner, conservationist and naturalist. River Mun” leading through Templewood grounds, through Frogshall Wetland and to the very secret “Little Broad”. The River Mun is part of a unique water purification experiment spearheaded by The Norfolk Rivers Trust. 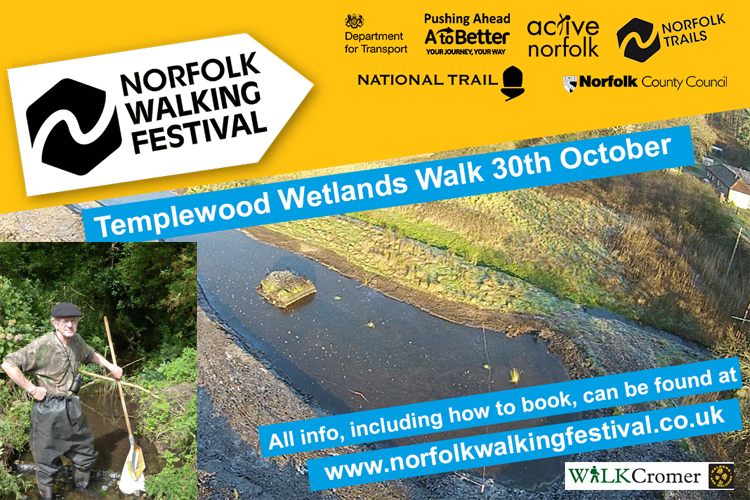 Eddie Anderson will talk about many of the features en route, point out aspects of the local wildlife, and detail the history of Templewood itself. Getting there: Local bus from Cromer via Southrepps. In Northrepps village, pass Foundry Arms pub on right, after 50 yards take next right into Craft Lane. Follow narrow lane for 3 quarters of a mile until Templewood gateway and drive appear on a sharp bend. Parking in front of Templewood house. Any other information: Bring own refreshments. No toilet facilities.